Paperwork takes forever in China. No really. We went to do our resident permit paperwork on 5 different days. One day we had to go get medical tests done (that is an entirely different story) and that took the entire morning! Another day we had to go to the police station and have them print something and sign it. There was actually one week we were not really in the office for Monday, Tuesday, or Wednesday. We went to work on residence paperwork because with all the people quitting, things got screwed up and they were late in applying for our permits. On that Wednesday we just sat around all day waiting while the Chinese were arranging paperwork and filing for this or that. Jessica had to take a taxi back and forth from the office to the visa place 4 times. We went and got lunch and then Jared and I weren’t needed anymore soo we sat around in our little bus and ended up taking a 3 hour nap. We weren’t that far away from our training center so I don’t know why they didn’t just send us back in a taxi or have the bus guy drive us back. But I mean who can say that they got paid to literally sit around all day and take a nap, with free lunch I might add. That is especially good since when it came time to be paid for the first time, we didn’t get paid. After waiting 3 weeks we were bummed when it didn’t happen. We asked about it and Jessica and Grace said that we’d get paid that week. Well that didn’t happen either so we asked again the next week. We even gave them our bank account information so we could get direct deposit. Again, nothing. So finally the 3rd week after we were supposed to be paid, we addressed some of the above mentioned issues with Kelvin (CIEE contact in China) and immediately talks to Sally, (again she’s coming up in later post but for now all you need to know is she is the woman!!) and she came and talked to Jared and I. We got paid a few days later for a little more than half a month worth of working and we even got reimbursed for our medical tests which was 400 yuan. The only nice part about that was that we got paid 2 weeks later and we got our full pay for the month of March. So no need to worry about money anymore. Although, the gym membership and the trips to Wal-Mart, Metro, and Carrefour really take a toll on your wallet. Another recent struggle is that we have some new students. The two new students in Class C or the lowest level are really below even Class C, there should be a Class D for them. They don’t understand hardly anything and they can’t say much either. We have to work from the ground up on those two. I spent an hour and half teaching them and going over and over the names of family members. The next day at the morning briefing (each morning from 9-9:45 students present in English), one of them didn’t even say the right word for a family member. He called his cousin his sister. I was a little frustrated to say the least. It was a struggle to have class with them. Even with the basic vocabulary and an English-Chinese vocab list, they were struggling. Ahhh good thing I don’t have them that much. It took over 2 months to get work stuff. When I first started I was told I would get to wear one of the uniforms and I would get a picture ID for access to the building, my lunch money and to identify myself. I tried on a jacket that was the size of a 5 year old and that was the last I heard anything. Well, yesterday as I was about to leave for lunch one of the new secretaries just came up and started measuring me. I was like oh am I getting one of the black outfits from winter or one of the new ones or what. She had no idea but measured me up good. I had to guess my weight and thankfully I know my height from going to the gym. Soo we shall see what I get! … Summer outfit it is. I just tried on a medium and boy was it tight. Chinese people really are stick figures, and they tell me I’m tiny. Pshh you could lose your Chinese friend if they turned sideways. They are ordering me a summer outfit though so yay for not having to choose what to wear every day. I finally got my own ID 2 weeks ago. It was awesome. I didn’t know I was getting it so it took me by surprise. It has my picture (taken on the last day or orientation on 2-13-14), my English and Chinese name and it had my 300 yuan a month for food. Then the week after that, we got more money because the new month started! So Jared and I are rolling in the dough for lunch. What is even better is that the place we get lunch at, also serves breakfast and dinner. I went to breakfast with Sally (She is awesome, more to come on her) and I had warm soymilk while she had a fried egg and some porridge. So no matter what we won’t starve! That is always good news. Just when I was about to say everything was really coming together, much to my surprise, the office wifi has suddenly disappeared. UHHHHH What the hell how is the wifi just gone and vanished? There are other wifi available but of course they are all password protected. Crap. So now I’m sitting here at my desk wondering how that is going to work. Jared doesn’t have a work computer so he definitely needs the password and well I use my laptop a lot too. Plus ain’t nobody got time for expensive data fees, give me that wifi. That’ll be top priority starting Monday, if Jared doesn’t get that taken care of this afternoon. Hey everyone! This post was so long that I had to split it in two or no one would even make it to the end. 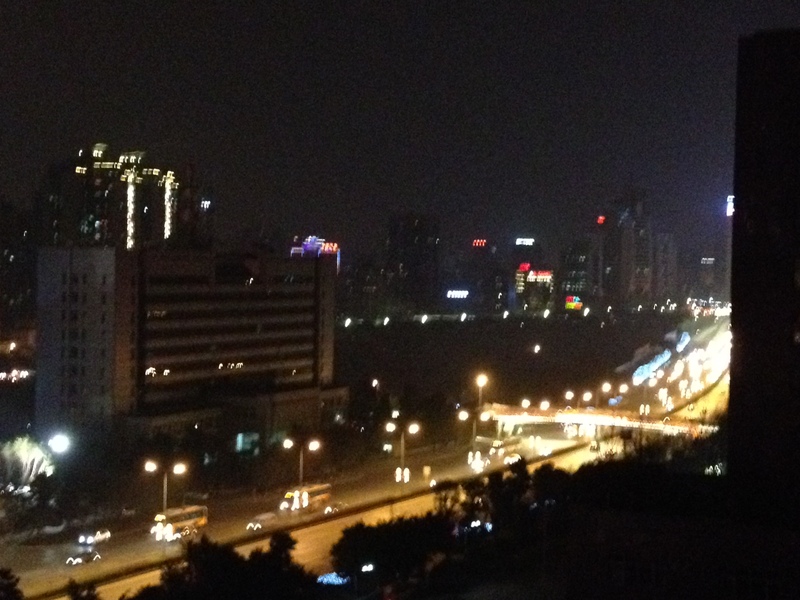 This one has been building since I arrived and started working in Chongqing. 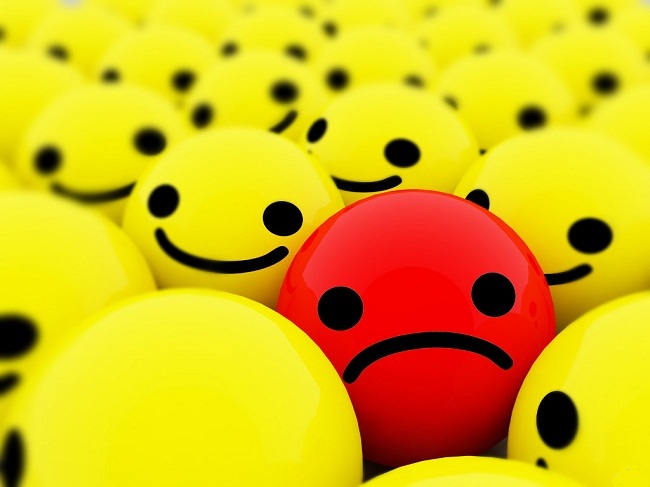 There are most definitely struggles that come with working in a foreign country, especially one such as China. Jared and I have had our fair share of struggles. Working in China really isn’t that hard. As one might guess, being an English teacher isn’t that hard for someone who is a native speaker. I mean I do actually have to prepare lessons and other office work. Once that is done, I sit around at my desk doing whatever I want from studying Chinese to writing posts for my blog to emailing. The thing that is the hardest is that my office is always in a state of chaos. People quit all the time. We had 7 different secretaries in 5 weeks. One girl was here for 2 days and quit half way through her second day. We work in a government building so the turnover rate is really high. My boss is also a problem. No one likes her and she is mean to her employees. She’s always been nice to Jared and I but that’s because we’re foreigners and we can’t really talk to her since she doesn’t know English. We call her the dragon lady because the first time we met her she was pissed and yelling in Chinese. I didn’t know anyone could speak a language so fast. Dragon is good in Chinese so if she ever hears it she won’t be offended, but we know it’s because she is one scary lady when she’s pissed. She makes the secretaries work long hours and they don’t get paid that much. The longest girl we had was Christy. Jared and I named her because she didn’t have an English name and Christy just seemed appropriate. She was here for a little over 2 weeks. Actually now that I’m writing this, Jessica has been here for 3 or 4 weeks now. That’s a record! She speaks almost perfect English. I’m not sure why she’s stayed but she has and she doesn’t seem like she’s going to quit anytime soon. That’s actually really good news. When people are always quitting, nothing gets done. 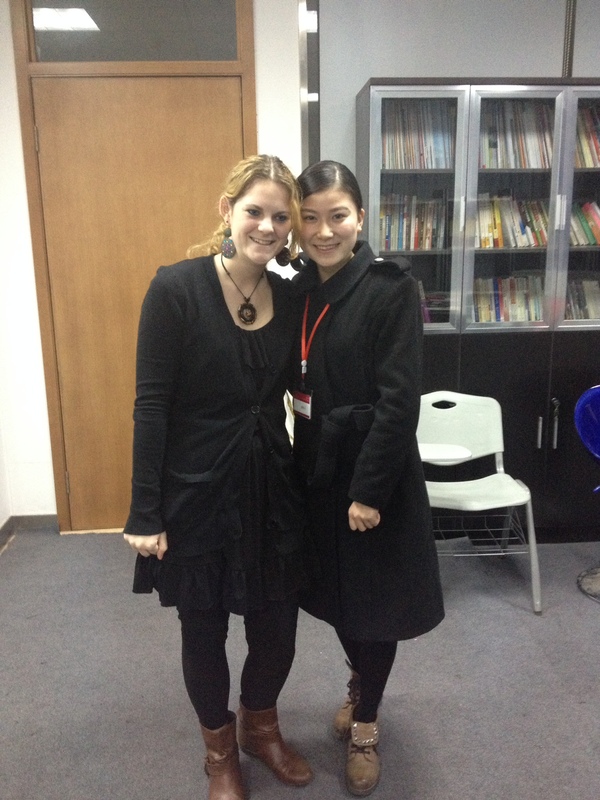 One of the Chinese teachers, Maggie, recently quit because she’s getting married and her fiancé doesn’t live anywhere close to Chongqing. Our office just hired 3 new secretaries and I even had to give up my desk because they wanted the teachers and the secretaries at separate spaces. The 4 desks closest to our boss are for the secretaries and the 4 closest to the door are for the teachers. So I got Maggie’s desk. I wasn’t happy that after I just organized my desk and cleaned it all out and made it mine that I had to move. Especially since all my files are on that hard drive, but this is China and you have to go with the flow if you want to survive the craziness that is China. Another reason our office is always “patas arriba” (my madre in Spain taught me this b/c of my room) or a complete disaster is that people frequently don’t come into work when they don’t feel like it. There have been several days Jared and I are the only ones to come in. The first time it happened we asked ourselves if there was a group strike that we just weren’t informed about. No, that wasn’t the case. One lady was trapped in her house… Not sure if she was being held prisoner or if she was just having some sort of issues in her apartment or made up some excuse. The other two teachers were hung over from partying the night before. And our office manager went on his long awaited honeymoon that no one told us about. I have no idea where Dragon lady was. Jared and I had no idea what to do and the students were like wait what? Where is everyone? So we ended up watching a movie and playing trivia games. It wasn’t a bad day actually. The students had a pretty good day I think. So after that we learned to just go with the flow because you never know what is going to happen. That is the best possible philosophy to have in China. Otherwise, you might as well check into a mental hospital and call it day because you’d drive yourself crazy trying to control things in China. Nothing ever goes as planned. 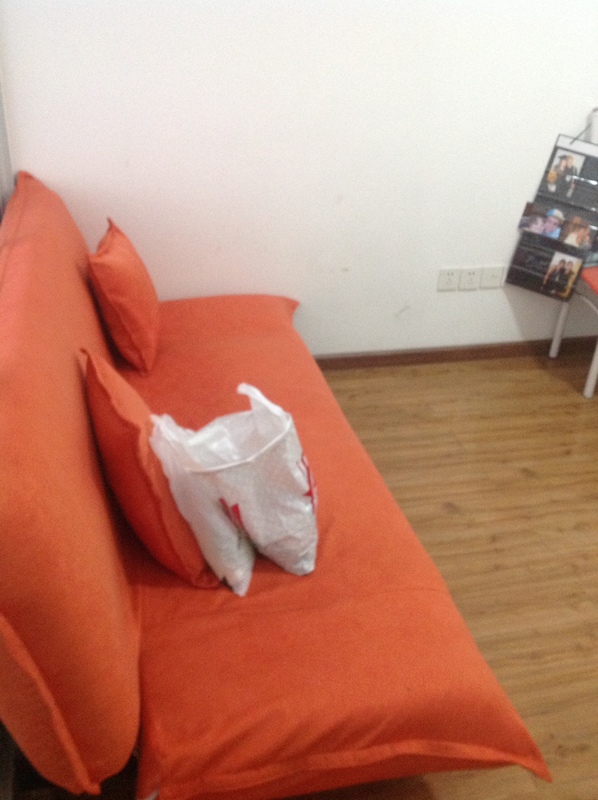 My apartment… What to say about it? It’s small but not so small that I cant have people over.Well maybe it’s best to use pictures. This is my apartment building. I’m on the 8th floor. This is my hallway. 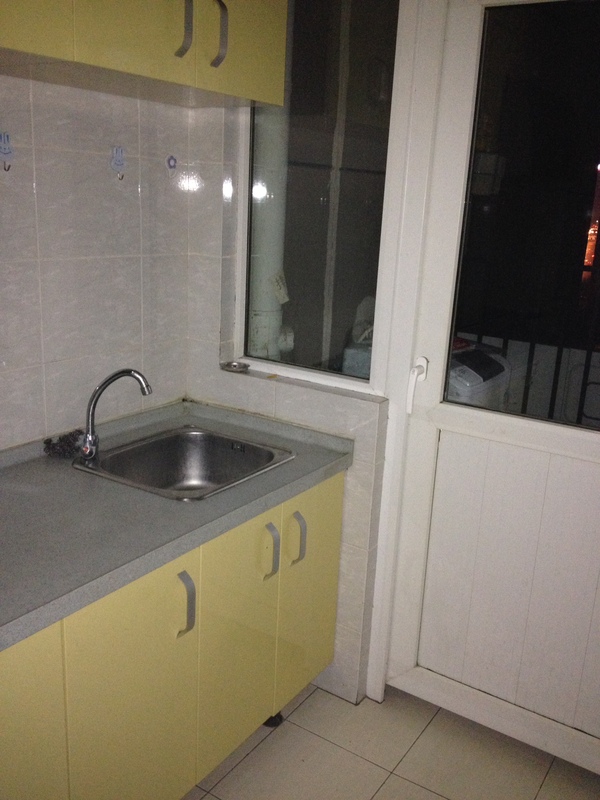 To the right is my kitchen and to the left is my bathroom. This is my bathroom. 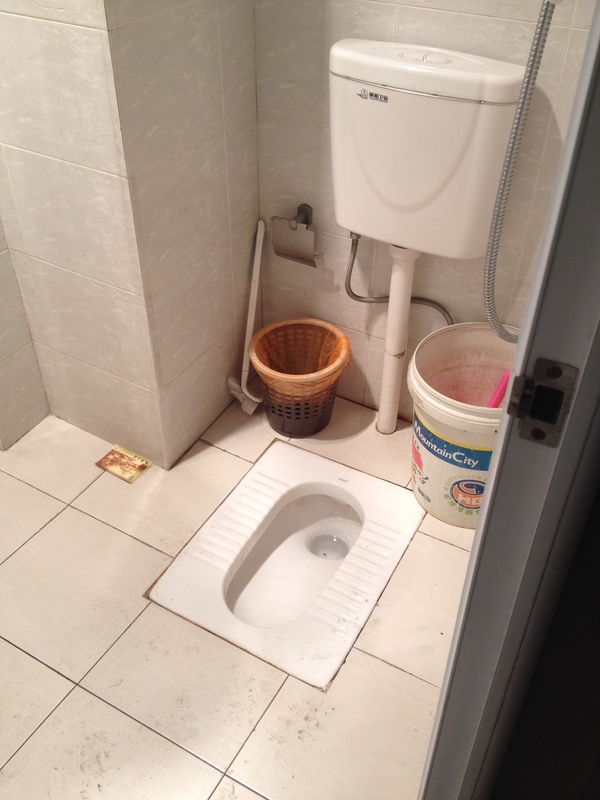 This is a squat toilet for all you who have never heard of or seen one.That was me when I got here. It was a little bit of an adjustment, but they really aren’t that bad. My bathroom floor gets dirty quicker than humanly possible. I clean my floor before I take a shower seeing as my shower is above my toilet. Interesting right? It was a shock and I wasn’t sure how to work that one out, but the water goes pretty far so I stand on the corner and it’s all good. This is my kitchen. This is the counter, the sink and the door that opens up to my little porch with my washer on it. These are my gas burners and my fridge. I don’t cook as much as I should but I’m cooking more and more. 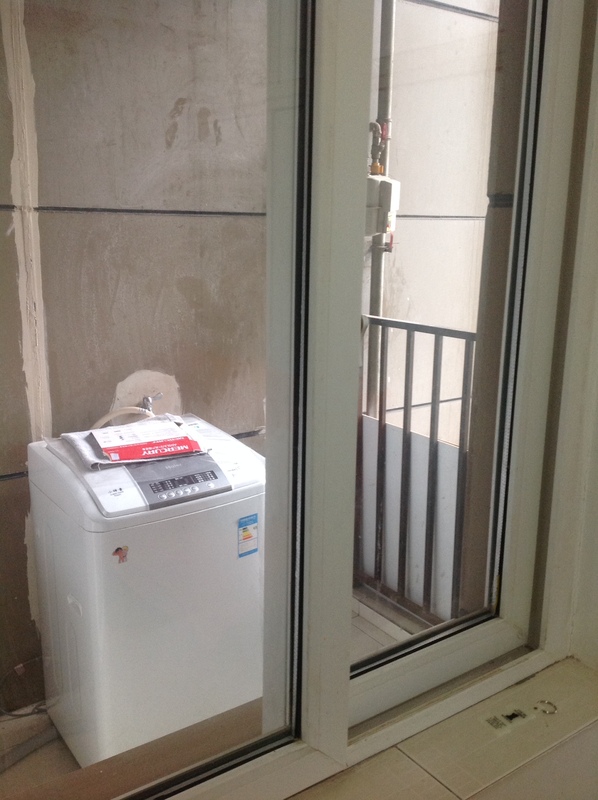 This is my little balcony and my tiny washer. It works really well. It’s all in Chinese and I figured it out. I’m getting pretty good at that. 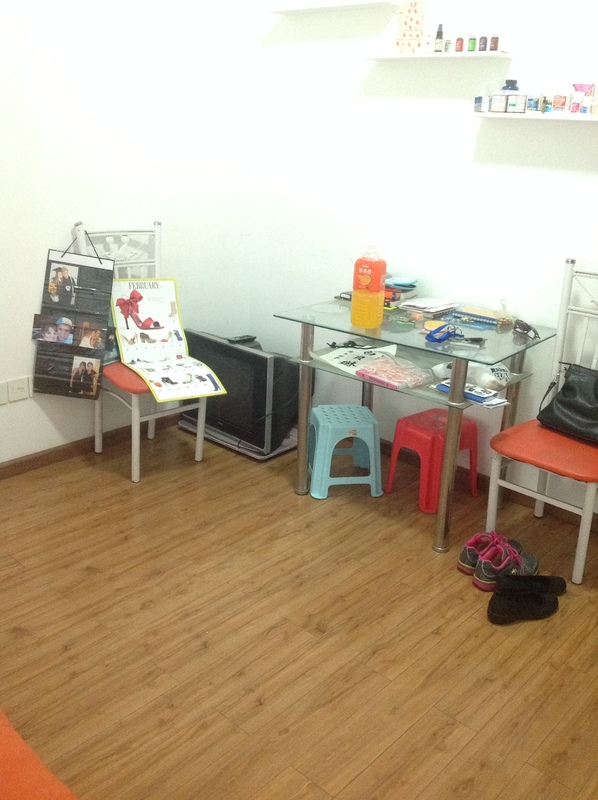 This is my dining area of my living room. As you can see I have 2 chairs and 2 little stools. I also have a nice 2 layered glass table. My table is like a catch all. I don’t have storage and I don’t have many places to put my stuff. This is my couch. It is actually pretty comfortable and it can be a second bed if needed. It also is a catch all. I have all my bags and backpacks and coats on it. I try to keep it clean but I don’t use it anyway. I have a tv that doesn’t work because I don’t have cable. I have a bedroom that is separated from my living room by sliding glass doors that you can only kind of see through. This is my bed. It’s actually 2 beds on top of each other. It’s not comfortable at all. I think the first night I really slept on a rock. I had to buy a “mattress pad” or should I say another comforter. 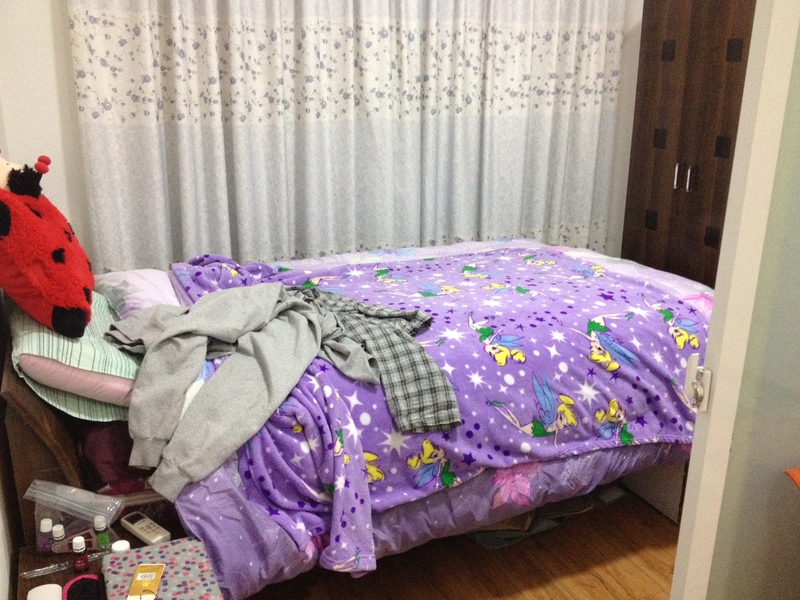 It is a big bed thought which is nice. I have space to sprawl out! On the right I have a closet and a little stand. I also have a night stand next to my bed. So that is all I have. My apartment isn’t that big but it’s perfect for what I need. I like my neighborhood, the little store downstairs with the people that I’m getting to know, the small supermarket down the street, how close I am to work, the fact that Jared live 20 floors above me, and that I’m super close to all modes of transportation. This is my humble abode for the next 4 months, possibly longer should I choose to stay. On my very first day teaching here at Chongqing Talent, I taught Class C, the lowest level class, and there was only had one student in it at the time. It was the class right after lunch and the student’s name was Emily. She didn’t speak very good English and it was a rough class. It was rough because I was nervous. It was my first class after all and I didn’t know what level of English she had. We worked through it though and I got to actually be able to say her name. I wrote it out how you said it, not how it is spelled. So Emily becomes Emma-Lee. We worked a lot on pronunciation during those first few classes and it was only us. 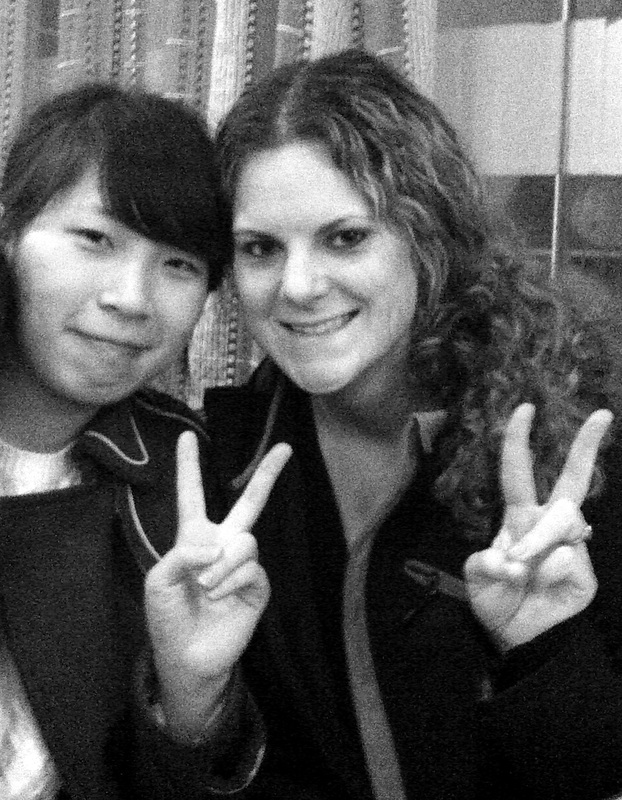 We became friends and she quickly became my favorite student. 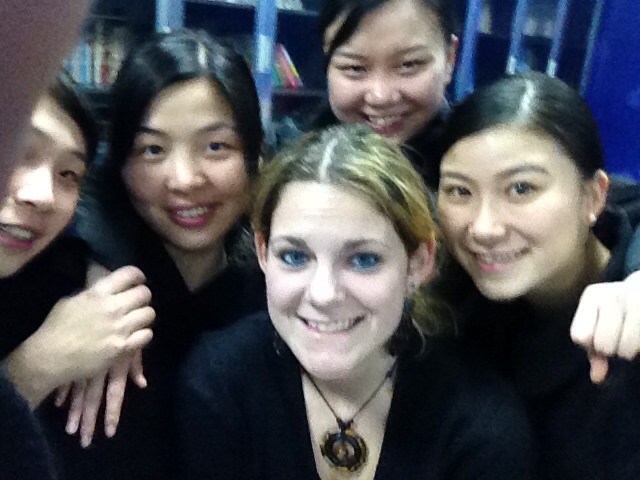 Fast forward a few weeks, Class C grew to 5 students and I gave them my WeChat number so that they can message me. WeChat is like Facebook in a way. It’s a messaging app but you can post pictures and statuses. Everyone has WeChat, I mean EVERYONE! So that same day we had a photo shoot in Class C and it was really fun. Fast forward a few more weeks, to about 2 weeks ago, and that’s when everything went downhill. We had more people in the office quit and people not show up. Some of the students got very upset and wondered why they paid all this money to come here when people quit and don’t show up. They pay A LOT of money to come here, something like $9,000USD. Crazy right?!? I can’t even imagine paying that. Anyway, a few students from Class C asked for a refund and they one by one have left the center to go back to their homes. 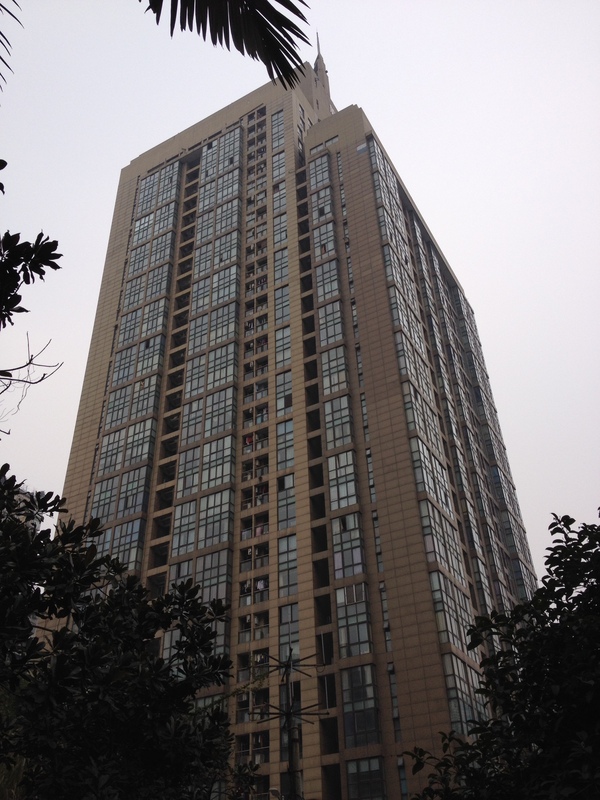 The first to go was Rollicking who was the newest of all the students and lives right here in Chongqing. 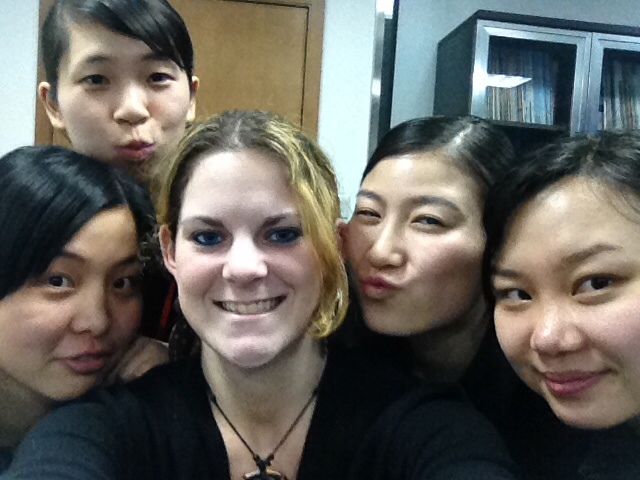 Then Alicia left at the end of last week and left on the train last night to go back to Wuhan. 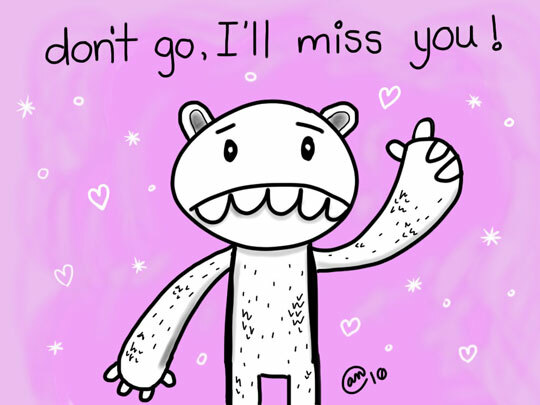 And lastly, Emily, my friend and student, left today. It was the saddest of them all. We started here together and now she is gone. She is from Chongqing as well, but she is leaving this afternoon for Beijing. Her uncle got her a job there. 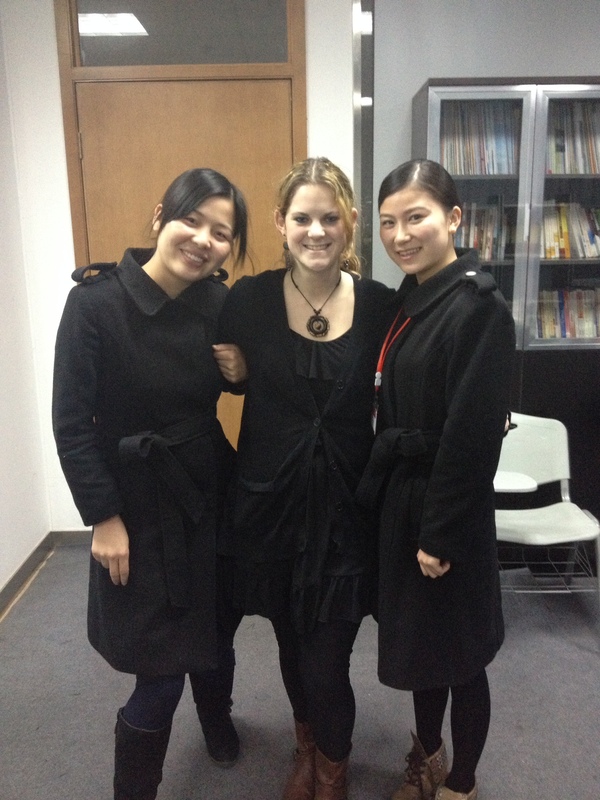 She also went to college in Beijing so she is very familiar with it and has many friends there. Alicia and Emily are my friends. I met them outside of class many times. We ate Malatang together and they took me shopping for my birthday outfit. They even bought me the earrings and necklace to go with my dress for my birthday. They are so sweet and nice. Emily was going to teach me how to cook REAL Chinese food. We might do some sort of video call or maybe she’ll send me recipes. Of course, we’ll have to go to Beijing to see her or maybe we can meet up somewhere and travel together. She is always welcome to visit me wherever I am. It’s a sad day. The weather here fits my mood. It’s rainy and smoggy and cold.